Hei, osallistun tällä viikolla suunnittelijana Crafting by Designs haasteblogissa, teema on talvi, kimallus ja säihke! Upeat huuruiset auringonlaskut innoittivat näihin kortteihin. Hi, this week I'm honoured to be a guest designer at Crafting by Designs, the theme is "Winter / Glitter/ Sparkles. 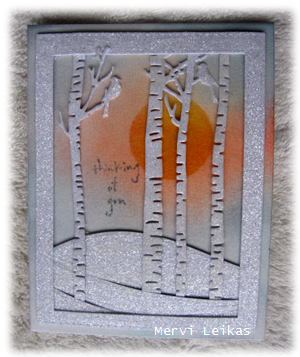 I've got my inspiration for these cards from the beautiful frosty sunsets we have enjoyed here at Finland last few weeks. Absolutely love these Mervi, so much depth with the sky coming through the trees. Päivä jo ihastelin fb puolella! Awesome. Thank you for joining us over at Craft Your Passion challenge. Look forward to seeing you again. Such beautiful cards Mervi. Love the tree dies and gorgeous inked backgrounds! Oh, I do love these Mervi! There's something so peaceful about these winter sunsets scenes... Wow. 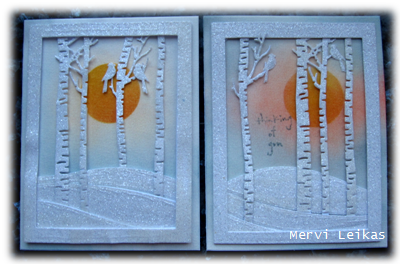 I love your beautiful frosty sunset cards, Mervi - they give such a frosty feel with the sun peeping thru the bare trees. Thank you for sharing this with us at Winter Wonderland - I hope you will join us again soon. These are beautiful Mervi. I love the die you have used and the sunset behind it is almost mystical. Thanks for joining in with our 'Glitter and Shine' challenge at Winter Wonderland this week, hope you will join us again.